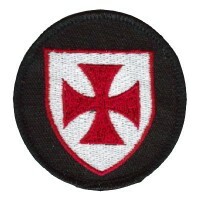 The Knights Templar Shield patch is about 2.5 inches in diameter. I have been asked to make several new Masonic and similar organization patches from many groups across the country. The patches requested by these groups and chapters are not always labeled correctly by the time they get to me. If any of the patches are named wrong or mis-labeled on our site, no disrespect is meant. I just may not know the actual name. Please do not send me hate mail for trying to help these organizations.